The interaction of the solar wind and Earth's magnetosphere is a frontier topic in the study of space physics. Previous studies have shown that Solar wind/ interplanetary magnetic field (IMF) controls the field-aligned currents (FACs) in the magnetotail. However, due to the limited exploration technology, its physical process remains to be unclear. 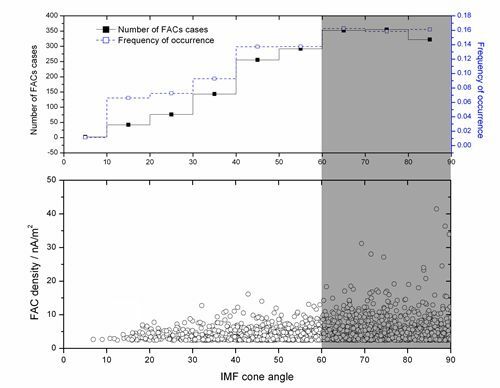 No study concerning the effect of IMF clock angle and cone angle on the FACs has been made so far. Recently, Cheng Zhengwei, Shi Jiankui, Dunlop M and Liu Zhenxing from the State Key Laboratory of Space Weather, National Space Science Center (NSSC), broke the deadlock and revealed the relations between IMF clock angle φ and cone angle θ and the field-aligned current (FAC) in the plasma sheet boundary layer (PSBL) in the magnetotail. 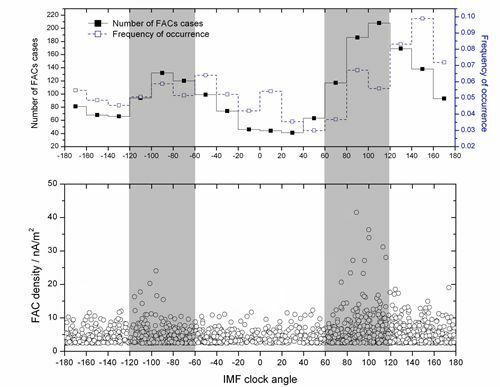 In this study, by statistically analyzing 1839 FAC cases from July to November in 2001 and 2004, the effect of the IMF clock angle and cone angle on the FACs in PSBL has been investigated. For the first time, the research group reveals the relations between IMF clock angle and cone angle and the FAC in the magnetotail. The results show that the FAC occurrence increases monotonically with IMF cone angle, and has two peaks at -90º and +110º clock angle, respectively. The peak at +110º is distinctly larger than that at -90º. Additionally, there are more FACs between 0°<φ<180°, indicating that FACs occurrence is closely associated with duskward IMF; more FACs occur when 90°< |φ|<180°, implying that FAC is closely associated with southward IMF. More than that, the research group also concludes that large FAC densities occur when 60º<|φ|<120º. The density has two peaks and the peak at +90º clock angle (duskward IMF) is larger than that at -90º (dawnward IMF). "This work will have a vital scientific significance towards a better understanding of the solar wind-magnetosphere-ionosphere coupling and the physical process of the solar wind energy transport. It will also help to understand the causal chain of space weather and build its physical model.” said CHENG Zhengwei, space physicist at state key laboratory of space weather and lead author of the article entitled Influences of the interplanetary magnetic field clock angle and cone angle on the field-aligned currents in the magnetotail. The article was published on Geophysical Research Letters (Volume 40,doi:10.1002/20 13GL056737) hosted by American Geophysical Union. Citation: Cheng, Z . W ., J. K. Shi , M. Du nlop , and Z. X. Liu ( 2013) , Influences of the interplanetary magnetic field clock angle and cone angle on the field-aligned currents in the magnetotail, Geophys. Res. Lett., 40, 5355–5359, doi:10.1002/20 13GL056737.